Fire safety and prevention is a very important subject matter whether it goes for your family or fellow colleagues. Being able to roperly put out a fire when the time may come, may just me the difference between life and death. Take the time to know where the fire extinguishers are house at your workplace and at your job. Educate your family on where the fire extinguishers are kept in your home. Schedule a tutorial to teach them the basics of putting out a fire should they need to know. Use extreme caution and remember to stay calm if a fire breaks out. Trying to extinguish is a good idea if you notice the fire in an early stay. Big fires may not be able to be doused with an extinguisher alone. If the blaze has grown to a size that is larger than youa re, then you should call 911 for help. 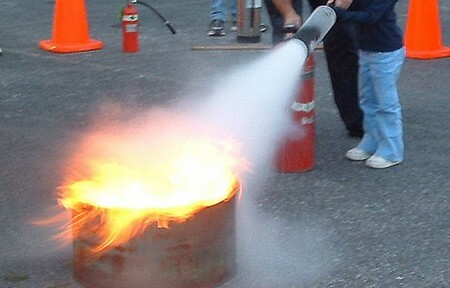 Read on for more information on how to use a fire extinguisher. There is an easy way to remember the proper protocol in case a fire breaks out near you. It is an acronym called PASS. The acronym stands for “pull, aim, squeeze and sweep.” You should familiarize yourself with where the near fire extinguisher is in your home or at work. In case of a fire, grab the nearest extinguisher. Remember this acronym and stay call. Pull the nozzle of the extinguisher out and point it towards the base of the balze. You want to cut the fire off at the root of it. Then, aim the hose at the bottom of the blaze. Squeeze the trigger to release the fire quenching ingredients of the fire extinguisher. And sweep across the base of the fire in an even motion. Keep the fire extinguisher in an upright position. Cut the plastic holder from around the handle of the fire extinguisher. Pull the pin out of the fire extinguisher handle. Aim the fire extinguisher nozzle very low at the base of the fire. Keep the extinguisher is position upright. Squeeze the fire extinguisher handle. The contents well be sprayed into the fire to smother it. Slowly move closer to the fire as much as you can in a safe manner. When you see the blaze diminishing move in closer to finish the task at hand. Focus the spray directly at the base of the fire. Move your aim in a sweeping back and forth motion. Use the correct motion. Remember to sweep the fire extinguisher from right side to left side. Continue. Put the fire out totally.